Often it's said that you cannot install and run 2 VPN clients on a Windows platform. Those, like I, that know different and have legitimate use for "double hopping" VPN connections, will be glad to know that after extensive testing, I have found 2 popular VPN clients both of which run fine under Windows 7 Release Candidate (build 7100). What's more is that they both work together to give you that "double hop" experience! Of course, these VPN clients don't have to be installed together - they run just fine individually. So if you are after a Windows 7 VPN client, here you go! The VPN client details and download locations are below. Search for "version 6.07" on the page. Although it's listed as a Vista VPN client, this one works fine with Windows 7. Connection profiles are held in "baynet.tbk" file, so copy this file from an existing Nortel Contivity install. Group ID & Group password (under Options > Authentication Options) will have to be filled out manually on the new install - unless anyone knows how to also copy these from one machine to another... answers on a postcard please!! 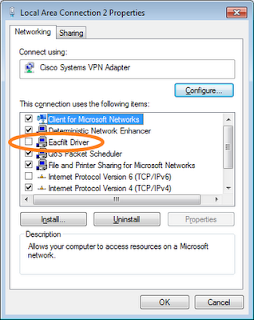 Connection profiles are held in [cisco vpn client install location]\Profiles folder. One file per connection, usually with file extension .pcf. Just copy these between machines and off you go. As the Nortel client is usually the client that gives the most grief, I install this one first. Reboot and install Cisco client. Reboot once again, and your good to go. Windows 7 - Dual VPN was published on May 19, 2009 .